Via Next Big Future comes this from Westinghouse, the manufacturer of the industry standard AP1000 nuclear generator that they are planning to mass produce a new line. 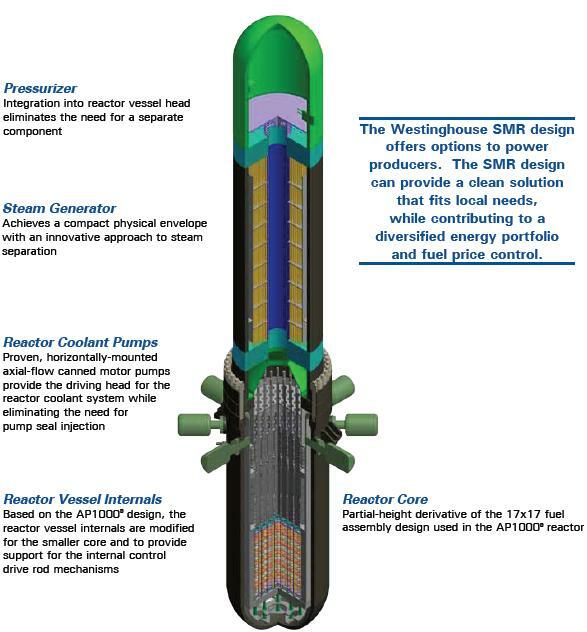 The Westinghouse SMR. >225MWe. Passive safety systems and an extension of the AP1000 technology. Simple compact system configuration reduces operations and maintenance and cost. Since the AP1000 costs around $1.8bn but in quantity $1.2bn (£800 m) so when these are being mass produced if they cost less we are talking of not more than £200m a shot. Because they are tall objects designed to be buried 4 of them should only take up about as much space as 1 conventional reactor. This does look like being a breakthrough and one which it will be difficult for the Luddites to regulate out of existence. Requiring no on site building & rail portable makes it easy to set up and at this power level even quite small communities can run them. And once they are being widely used it will become increasingly difficult to persuade people they shouldn't have one, or not to let them realise when 90% of the cost isn't actually being paid for the engineering but for the political regulatory parasitism. The biggest problem with nuclear has always been the political parasites. Because it has been such a big structure taking 3 years (plus political parasite time) to build it has been very vulnerable to changes in the political wind. We see the same effect in comparing the housing industry to the car industry. A century ago houses and cars cost the same. Houses have increased fourfold in real terms and car prices reduced because local authorities can control the land and thus the building of houses but you can just drive up in a new car. If that comes about in the nuclear industry and it becomes possible to just buy a transportable reactor off the shelf we should see the same effect. The manufacturers will not have to kowtow to political parasites - they just wait till the next customer rolls up. Since "Economic Freedom + Cheap Energy = Success" it may become impossible for the Luddites and parasites to retain at least half of the cause of the current recession. Admittedly they are unlikely to have this going in less than 18 months so it won't close the gap in our immediate blackout problems but the future is clear. There is no question that DDT use in the 1950s did reduce deaths from around 1 1/2 million a year to 10s of thousands and that the total differential since then amounts to around 70 million. The arguments against using DDT in a massive way are (A) that it is very dangerous and (B) that extensive use will bring about reduced effectiveness. (A) is clearly a false ecofascist scare story. This article 100 Things You Should Know about DDT must be be read by anybody wishing to pontificate on the subject and with the remotest interest in not killing more millions of people. There is no serrious evidence of danger, even to birds where the most serious claims have been made. There is no possibility that even unknown effects could render it 1,000th as damaging as the disease it prevents. In terms of human life the DDT ecofascist fraud has been even more damaging than the Linear No Threshold radiation ecofascist fraud which, in turn, has been more damaging that the current catastrophic warming ecofascist scare. (B) is not altogether false. Almost any chemical used in quantity will, over time, through evolution, cause some reduced effectiveness. However firstly it appears to be being considerably exaggerated since it is now the sole credible argument opponents have. Secondly it is not so much an argument against using it at all, as an argument for using it in large doses, quickly. In particular - small doses are most guaranteed to breed resistance since it is bound not to have a total effect.
. Also if long term breeding of resistance is a fear then ending the problem quickly is the obvious choice. Therefore if we really want to effectively end these deaths I propose a massive international campaign of malaria eradication using DDT to a full extent. Perhaps this might not entirely eliminate it everywhere, as smallpox was, because there are natural reservoirs of malaria whereas smallpox needed to live in humans. On the other hand the history is on our side. Malaria has been very much more extensive than it is currently. Malaria used to kill 10s of thousands in Britain. The same, but moreso, applied to the USA, making the southern states a death trap for white men. Even within the Arctic circle it killed 10s of thousands around Murmansk in northern Russia during WW1. It is effectively extinct in all of these now. There were other reasons than DDT, indeed it disappeared in Britain before DDT was discovered but that is all the more reason for believing it can be eradicated. The example of Sri Lanka given above does suggest that only a little more effort in 1964 would have cut the last 0.001%. The world is far richer than in 1964 and medicine far better developed. Clearly if we could come that close then it will be far easier now. It would be a big programme but we could save many millions of lives. If the political will is there.